Turntable trio take the spoils at the Awards 2015 | What Hi-Fi? The three best turntables of 2015 are all repeat winners, with Pro-Ject, Rega and Clearaudio all picking up where they left off in 2014. Thanks to each deck's blend of brilliant sound quality and excellent value, rival turntables have struggled to make an impression. Our Product of the Year for a fifth consecutive year is the outstanding Rega RP3/Elys2. We’re still to come across a deck at this price that’s as easy to set up or that sounds as good. 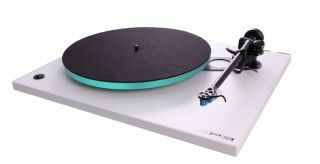 Rega has made a couple of tweaks to its turntable in recent years and the company hasn't looked back. Those improvements have allowed it fend off its closest rivals year after year - who's to say the RP3 couldn't be back in 2016? The Pro-ject Essential II is still without doubt our favourite budget deck, and the best option for vinyl virgins. We love its plug’n’playability, as well as the equipment you get for such a low price. It’s still as entertaining as ever and delivers a great sense of scale and composure. Finally, the Clearaudio Concept also retains its Best Buy Award. Its simplicity is still as charming as ever and the minimalist styling highly desirable. The level of sound quality on offer is still way above anything else at this price too, which makes the Concept one of the best turntables currently on sale.